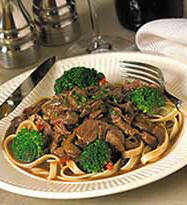 Gourmet Prepared Beef Beef Dinners - Gourmet meals prepared fresh daily by well-know chefs with fast home delivery. 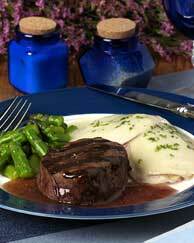 From prepared entrees, party appetizers, specialty side dishes to complete chef prepared dinners and meals. 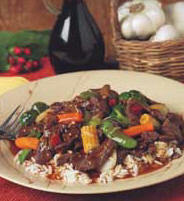 Beef dinner, prepared pork dinner, lamb or veal dinner meals, poultry dinner, seafood, pasta meals, or low carb foods. Just heat and serve. 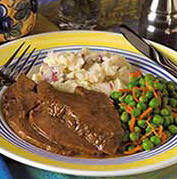 complete meals with side dish entree's and vegetables. 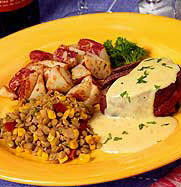 Home Bistro chef prepared dinners and meals... We create great recipes - everything from soups and appetizers to complete meals and desserts. Then, using only the finest ingredients, we prepare everything, with skill, know-how, and artistry, just for you. We do all the time-consuming things. We shop and we chop. We mix, blend, and sauté. We grill the steaks, roast the lamb, poach the salmon. All you need to do is follow the simple instructions to heat and serve our meals in about 10 minutes. It's that easy. 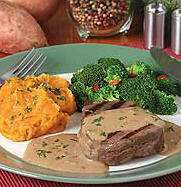 Grilled beef tenderloin in a cracked green peppercorn sauce made with white wine, onion, and garlic served with mashed sweet potatoes and broccoli florets with crispy red peppers. 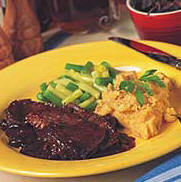 A tender, braised beef brisket in our own unforgettable barbecue sauce made with tomato pureé, molasses and spices and served with Yukon Gold mashed potatoes accented with chipotle chili powder and a blend of yellow and green beans.